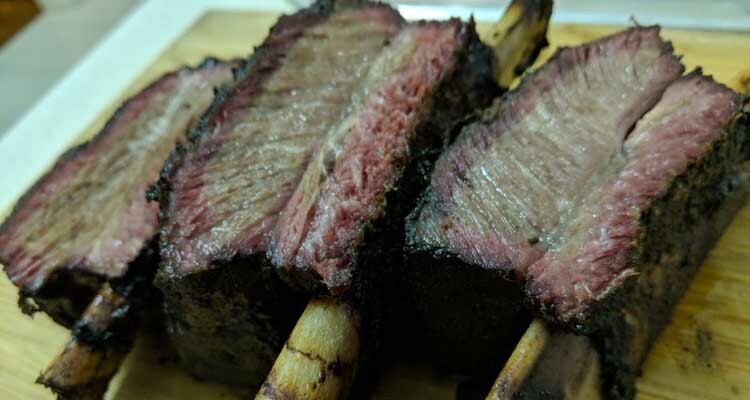 Beef short ribs are probably my favourite cut of meat to smoke at the moment. Don’t be fooled by the name. There’s nothing “short” about these huge meaty ribs though. These ribs contain more flavor, fat and connective tissue than pork ribs. There’s also a lot more meat on them! This does mean they take longer to cook. 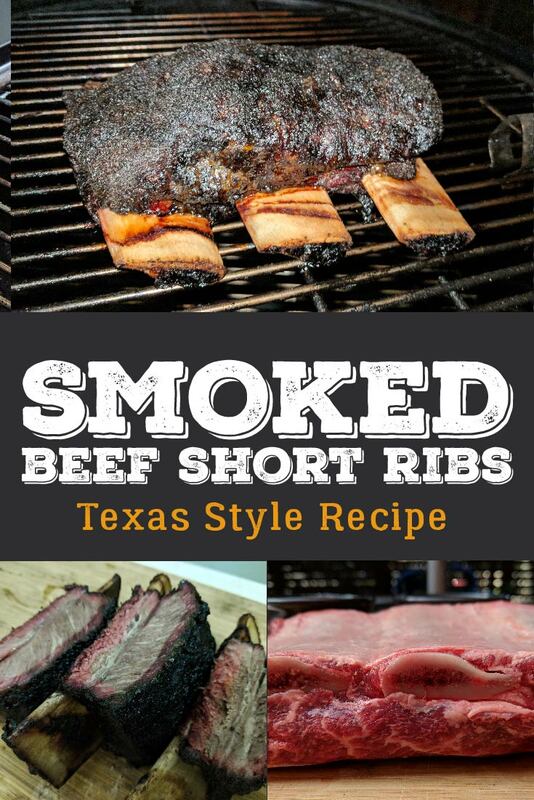 For this recipe we’re cooking Texas Style which means we’re skipping the sweet rubs and sauces. This will let the delicious beef flavor shine through. You can serve these on their own as a meaty snack, or pair them with beans and coleslaw. 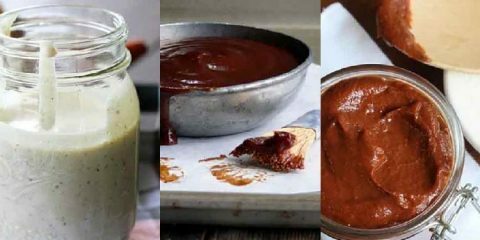 A binding agent like yellow mustard, olive oil or hot sauce and the ingredients to make your own rub. Check out #7 in this guide. 7 – 10 hours time until you need to eat. Before we get into how to smoke these bad boys, lets run through what to look for when you’re at the butcher. 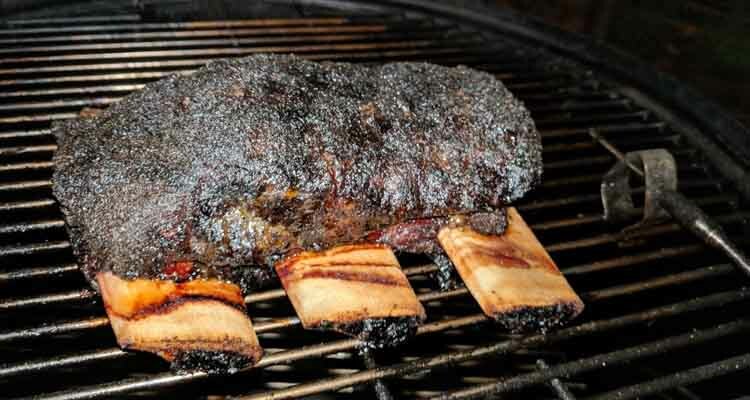 There are a few guidelines for choosing the best beef ribs to smoke. 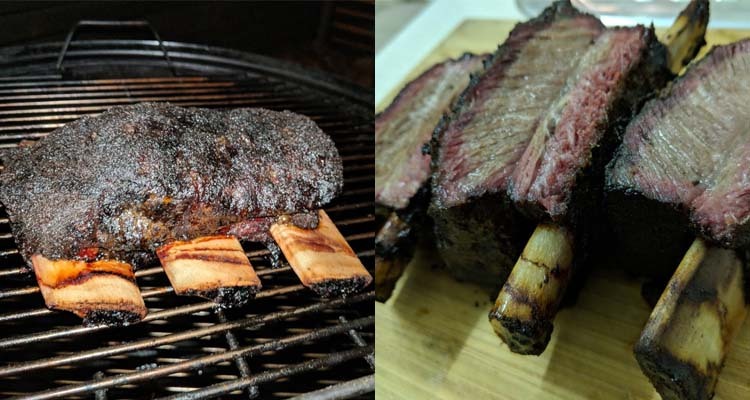 There are two main types of beef ribs. Short and back. Back ribs come from the prime rib roast and wouldn’t be suitable for this style of low and slow cooking. Try to get the best quality you can afford. 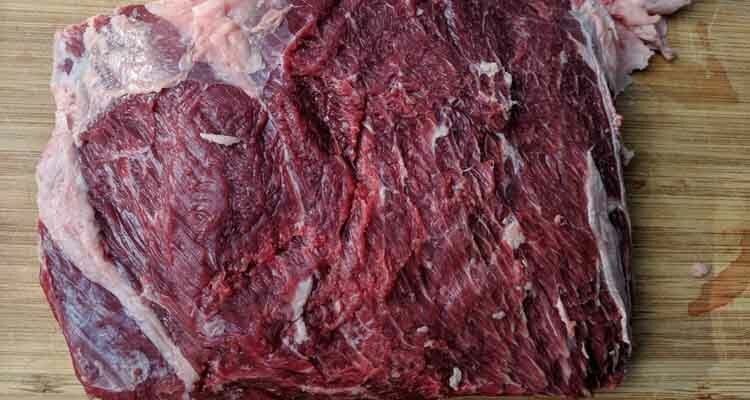 Some things to look out for include USDA Choice, USDA Prime, Wagyu, or Certified Angus Beef. For this recipe I found some USDA Organic ribs. 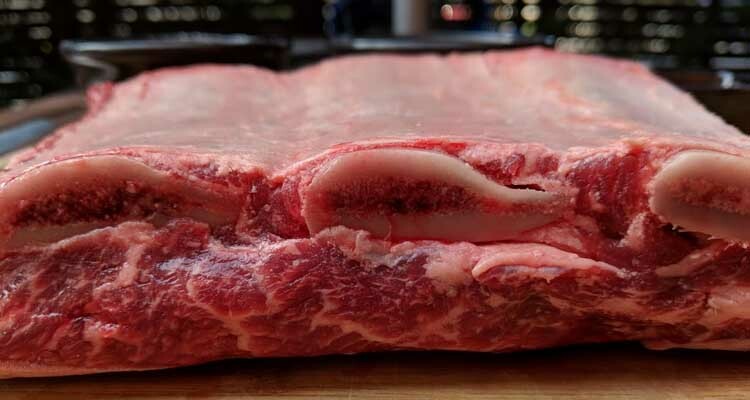 Look for a rack of ribs on the thicker side, with decent marbling throughout. You can see in the picture below the lines of marbling running through the meat. This is going to break down and make your ribs taste delicious! 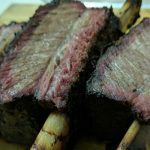 Now that you’ve selected your beef ribs you’re probably rearing to go. But before you can throw it on the smoker we need to make sure we maximize the flavor. 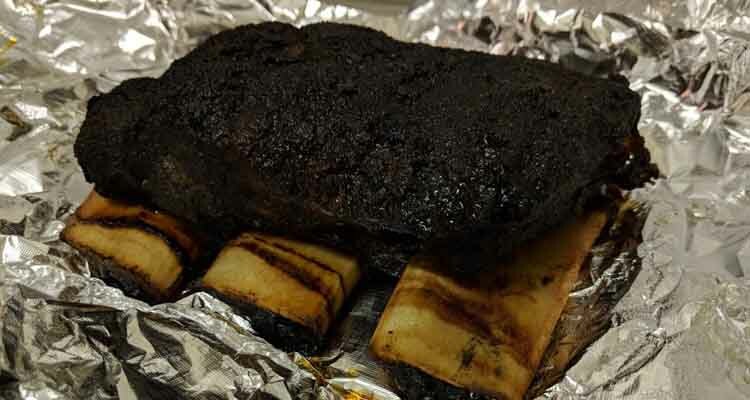 One of the best things about cooking beef ribs is that they are very easy to prepare. 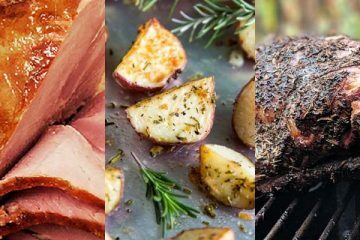 You don’t need to fuss around with fancy rubs, sauces or injections to get a delicious result. You don’t HAVE to remove the membrane from the exposed side of the bones but I like to take it off to get a tiny bit of extra rub flavor in. Use a paper towel to grab a corner of the membrane to make it easier to pull off. 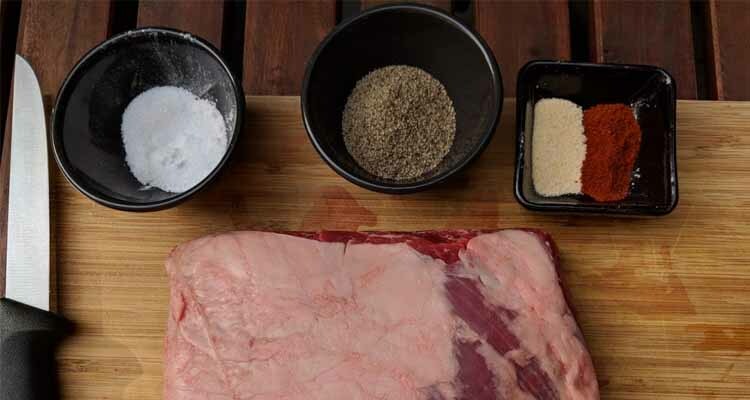 We’re cooking these ribs Texas style which means super simple. I could have just gone with 3 parts black pepper to 2 parts salt, but I like adding the garlic powder and smoked paprika. 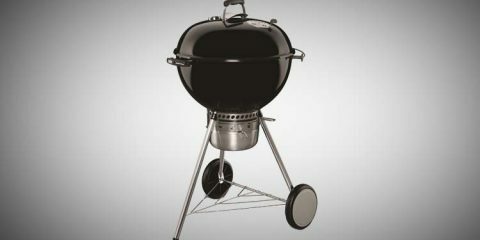 If you want to try something more fancy we have guide to the best barbecue rubs you can buy online. Be careful you don’t over apply the rub. You should still be able to see the meat, we don’t want a thick crust of spice! I tip all my ingredients into my rub shaker to make sure I get an even application. It doesn’t need to sit overnight or anything like that. Just leave it to rest while you fire up your smoker. Let your ribs sit for 20 minutes and absorb the rub while you get your smoker setup. Because I’m cooking low and slow I setup my smoker using the Minion Method. 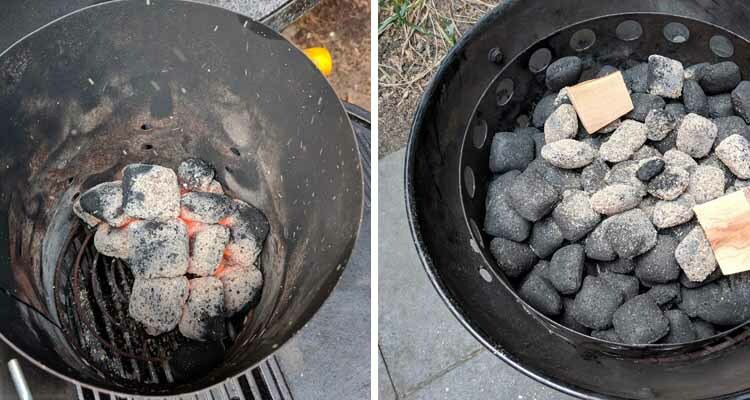 This involves lighting a handful of coals in my chimney starter and then pouring the lit coals over the over a pile of unlit coals. We are going to be cooking on the higher end of low and slow around 250°F. 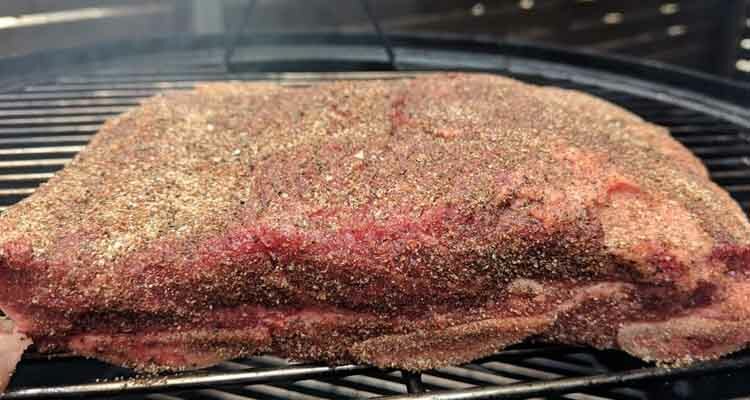 Aaron Franklin does beef short rubs at 285°F so feel free to experiment with temperature. Add the wood – I used Apple chunks but you could use any fruit wood or oak, which is traditional in Texas. Go easy on the wood. Those two chunks you can see in the photo below were enough to produce a deep rich smoke ring. You shouldn’t need to add any more wood and I wouldn’t bother turning the meat over. 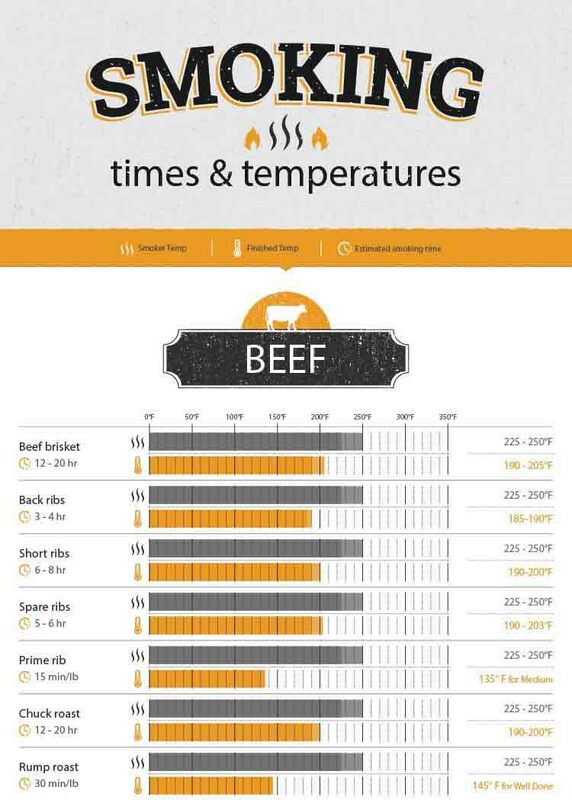 I wish I could tell you exactly how long it’s going to cook but there are so many factors that can influence cook time. I would say my ribs were close to 2″ thick and I took them off after 9 1/2 hours when they were probing around 205°. Now you need to sit back and wait until the ribs get to at least 200° internal temperature and the probe goes in like butter. 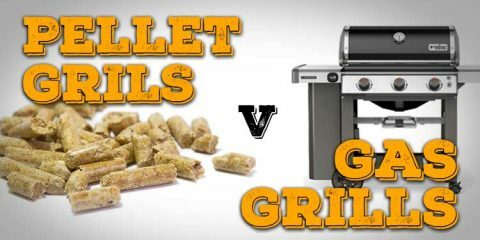 If you’re used to cooking pork ribs you might be in for a shock. This is what my ribs looked like after about 5 hours. You can see the bark still has a long way to go. These bad boys can take a long time to cook. 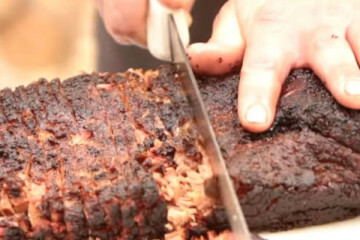 Some people choose to wrap the ribs around the 5 hour point but you really don’t need to. This is where all your patience pays off. The probe goes in like butter and measures at least 203°F. On the outside a rich dark crust should have formed. Carefully pick the ribs up and wrap in tin foil. Be careful not to damage the bark. A good tip I got from Aaron Franklin’s video is to pick the ribs up with a damp towel so you don’t accidentally damage the bark. In the photo above you can see my Smoke thermometer probe. I’ve been using it for about a year and it’s a beast. Check out my review here. Leave your ribs to rest for at least 30 minutes. If you’re serving them for a party you can easily leave them in a faux cambro for a couple of hours. Once your ribs have rested slice them into individual ribs with a good slicing knife. And that’s it! 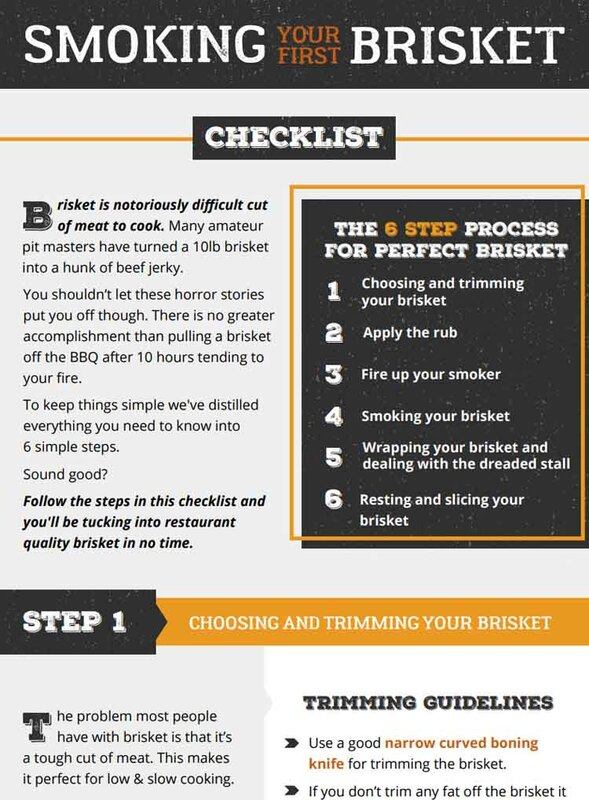 If you’ve followed this guide your ribs should be tender, with a rich smoke ring. The hardest part about this recipe is the amount of time it takes. But they wouldn’t taste as good if they only took an hour. You can’t tell just how moist and juicy these ribs were in the photo. When I picked them up and gave them a gentle squeeze there was juice oozing out of them. 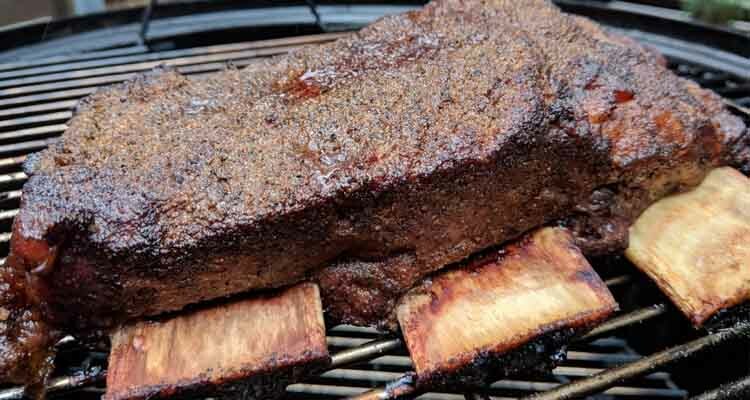 Skip the sweet rubs and sauces and let the beef flavor shine through in this recipe for Texas Style Barbecue Beef Short Ribs. 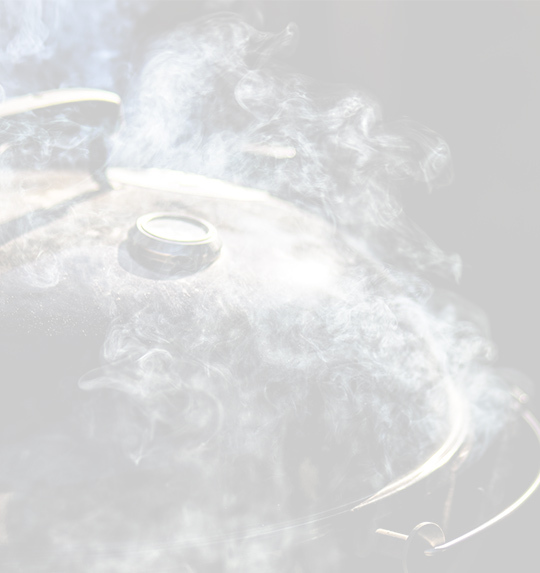 Prepare smoker for indirect cooking at 250°F using a neutral wood like apple, cherry or pecan.